Blueberry coffee cake is my culinary kryptonite. 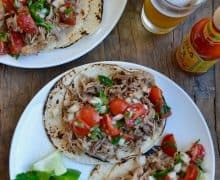 No matter where or what time of day, it is the perfect food. For breakfast? Obviously. Afternoon snack? You bet. Late-night dessert? Without a doubt. Chock-full of juicy blueberries and crumbly cinnamon streusel filling (and topping!) 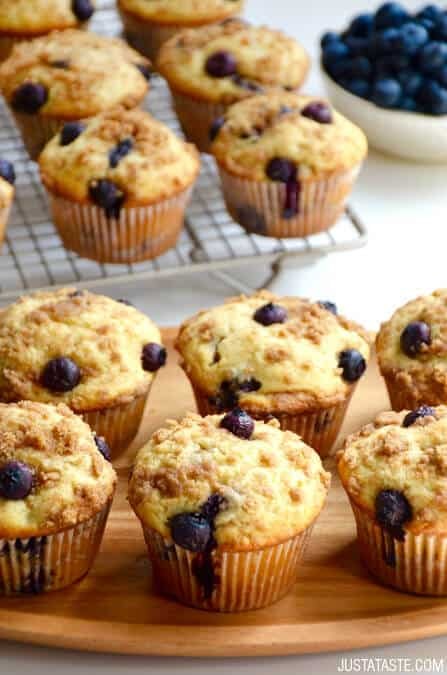 this quick-fix recipe will have you ditching the box muffin mixes for good. 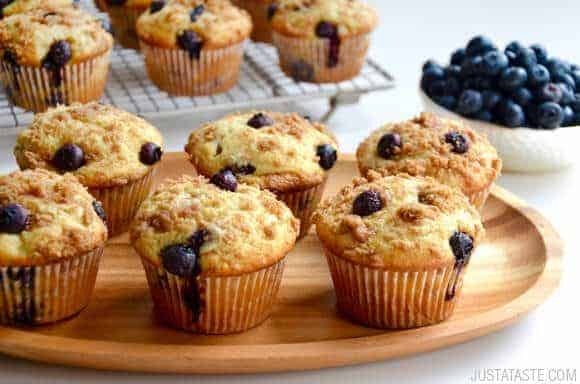 I’ve swapped the classic cake pan for a muffin tin, which makes these blueberry coffee cake muffins the ultimate snack-on-the-go. And don’t hesitate to switch up the fruit to suit the season. Any type of berry will work, as well as diced apples, peaches, plums, apricots and cherries galore! Looking for more ways to satisfy your coffee cake cravings? Don’t miss recipes for Strawberry Cream Cheese Coffee Cake, Sour Cream Coffee Cake Muffins and Raspberry Sour Cream Coffee Cake. 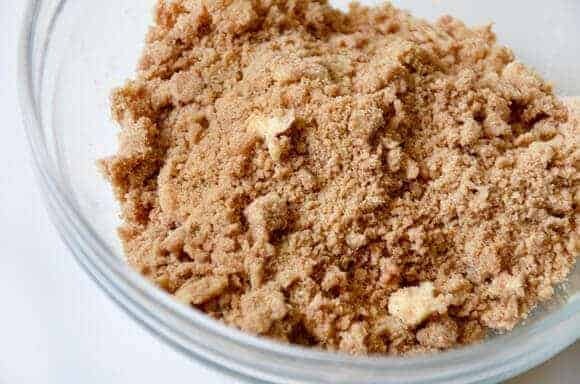 In a medium bowl, combine the flour, brown sugar, cinnamon and cubed butter. Using your fingers or two forks, work the butter into the mixture until it is the texture of wet sand. Set the streusel aside. Preheat the oven to 350°F and line a muffin pan with muffin cups. In the bowl of a stand mixer fitted with the paddle attachment, beat the butter, vegetable oil and sugar until combined, about 2 minutes. Add the eggs, one at a time, beating between each addition. In a medium bowl, whisk together the flour, baking powder, baking soda and salt. Add the flour mixture, sour cream and vanilla extract to the stand mixer and beat until combined. Fold in 1 cup of blueberries. 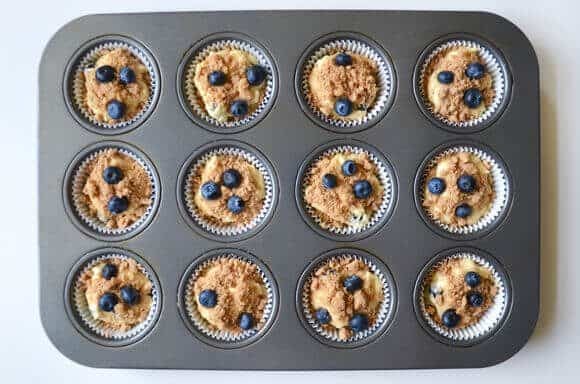 Layer the batter and streusel mixture into each muffin cup by adding a portion of the batter, topped by a layer of the streusel then another layer of the batter and a final layer of streusel. 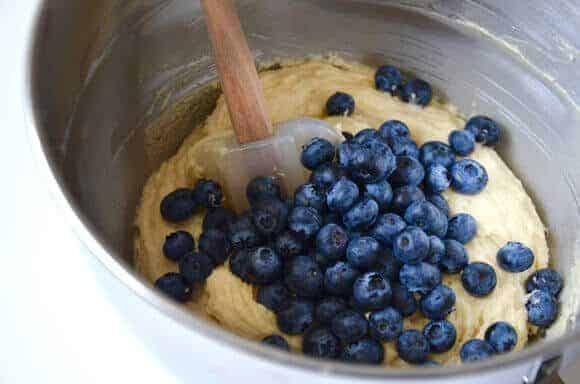 Top the muffins with the remaining 1/2 cup blueberries then bake the muffins for 18 to 20 minutes or until a toothpick inserted comes out clean. Remove the muffins from the oven and allow them to cool for 5 minutes in the pan before transferring them to a rack to cool completely.